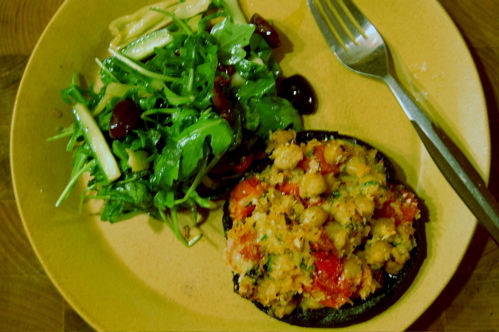 This meal started off as the consolation prize for portobello mushrooms burgers. 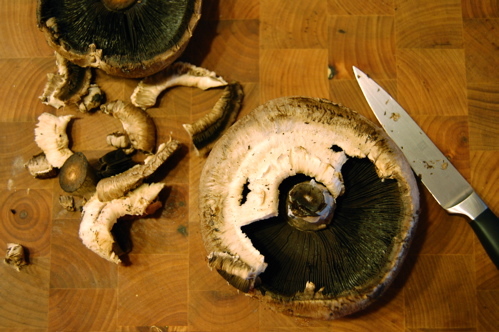 Mr Weiss and I had high hopes of re-creating the famous Peekamoose Portobello Burger on the grill last night, but seeing as mother nature came roaring back with a vengeance, after a very BRIEF respite, we had to back away from the grill and weren’t inspired to meekly make these inside. So after a quick perusal of what we had laying around in the fridge, an assortment of odds and ends I can tell you that much, I decided to stuff em instead. Reading between the lines here would be the correct assumption that the “stuffing” could now be anything on hand. Genius I know! 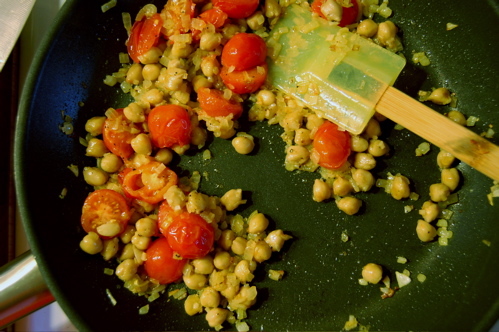 YES all roads do lead to sauteing the onions and garlic together, until soft, add chick peas, stir few minutes, then add cherry toms (or chopped toms) and cook until they collapse a little. Dump all this into a bowl and add the rest of the ingredients. 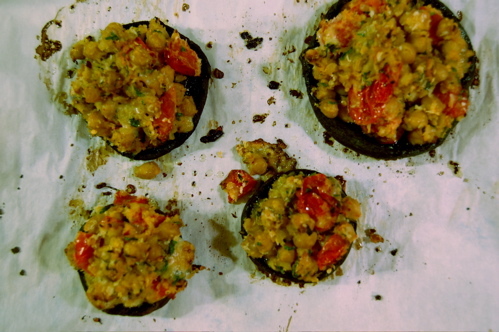 Rub the mushrooms with a little olive oil, place on baking sheet gill side down first and shove in oven, for 15 mins, flip, spoon mixture into top of caps, bake another 15 mins until filling is hot and cheese is melty. 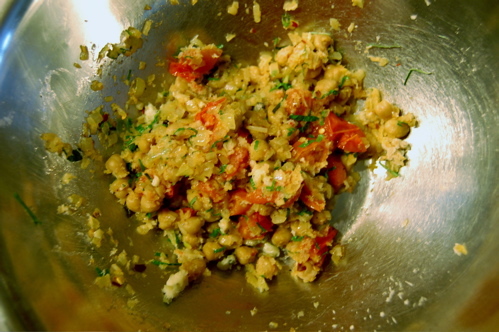 This entry was written by thecatskillkiwi and posted on July 1, 2009 at 11:45 am and filed under Pictures, Recipes. Bookmark the permalink. Follow any comments here with the RSS feed for this post. Post a comment or leave a trackback: Trackback URL.